A 35-year-old female presented with NYHA Grade 2/3 dyspnea and palpitations with an increase in severity for 1 month. After evaluation, she was diagnosed with severe rheumatic mitral stenosis (MS) (mitral valve area 0.9 cm2) with a giant left atrium (LA) (70 cm × 82 cm) and moderate pulmonary hypertension (pulmonary artery systolic pressure 40 mmHg). However, no LA thrombus was appreciated during preoperative transthoracic echocardiography (TTE) study. The patient was in atrial fibrillation (AF) and had unfavorable valve anatomy for balloon mitral valvuloplasty. She was posted for elective mitral valve replacement surgery. During an intraoperative transesophageal echocardiography (TEE), unexpectedly, a large thrombus was seen in the roof of the LA extending onto the interatrial septum (IAS) without involving the left atrial appendage (LAA) [Figure 1]. This finding was confirmed surgically after opening the LA. The size and organized nature of the thrombus in the presence of severe MS prevented embolization into the systemic circulation. This clot was missed by the initial preoperative TTE partly due to poor acoustic windows, the unusual location, and probable initial small size. Surgery was uneventful with complete thrombus removal and implantation of a St. Jude 25 mm mechanical mitral valve prosthesis. The patient recovered well without any neurologic dysfunction in the postoperative period. Rheumatic MS is associated with LA thrombus in patients in sinus rhythm (3%–13%), and markedly increases in AF (~33%). The presence of LA thrombus carries a risk of systemic embolization and neurologic morbidity. TEE is a sensitive diagnostic modality to detect LA thrombus, particularly in the LAA. It has a 97% sensitivity, 100% specificity, positive predictive value of 100%, and a negative predictive value of 99.6% to detect a thrombus. Small thrombus can be detected using contrast echocardiography which provides contrast opacification within the cardiac chambers to delineate the “filling defect” of the thrombus. Type V: Ball valve thrombus (free floating). The incidence of LA thrombus according to types has been reported in a few small studies as Type Ia (64%–76%), Type Ib (9%–32%), Type IIa (3.6%–12.5%), and Type IIb (2%)., However, in this case, the LA thrombus shared characteristics of both Types IIb and III with Grade 0−1+ spontaneous echo contrast (SEC). The risk factors for LA thrombus formation in MS include AF, previous embolic episodes, age >40 years, LA dimension >4.5 cm, and LAA emptying velocity <20 cm/s. However, MS patients in sinus rhythm are also at risk of LA clot formation with an inferosuperior LA dimension >6.9 cm, mean mitral gradient >18 mmHg, and SEC Grade >3. This case again highlights the utility of an intraoperative TEE in diagnosing unreported and missed cardiac pathologies during preoperative screening. Patients with MS are at increased risk of thrombus formation anywhere within the LA irrespective of the cardiac rhythm. Accordingly, screening of the entire LA during intraoperative TEE is of paramount importance. Davison G, Greenland P. Predictors of left atrial thrombus in mitral valve disease. J Gen Intern Med 1991;6:108-12. Saidi SJ, Motamedi MH. Incidence and factors influencing left atrial clot in patients with mitral stenosis and normal sinus rhythm. Heart 2004;90:1342-3. Srimannarayana J, Varma RS, Satheesh S, Anilkumar R, Balachander J. Prevalence of left atrial thrombus in rheumatic mitral stenosis with atrial fibrillation and its response to anticoagulation: A transesophageal echocardiographic study. Indian Heart J 2003;55:358-61. Manning WJ, Weintraub RM, Waksmonski CA, Haering JM, Rooney PS, Maslow AD, et al. Accuracy of transesophageal echocardiography for identifying left atrial thrombi. A prospective, intraoperative study. Ann Intern Med 1995;123:817-22. Krishnamoorthy KM, Tharakan JA, Titus T, Ajithkumar VK, Bhat A, Harikrishnan SP, et al. 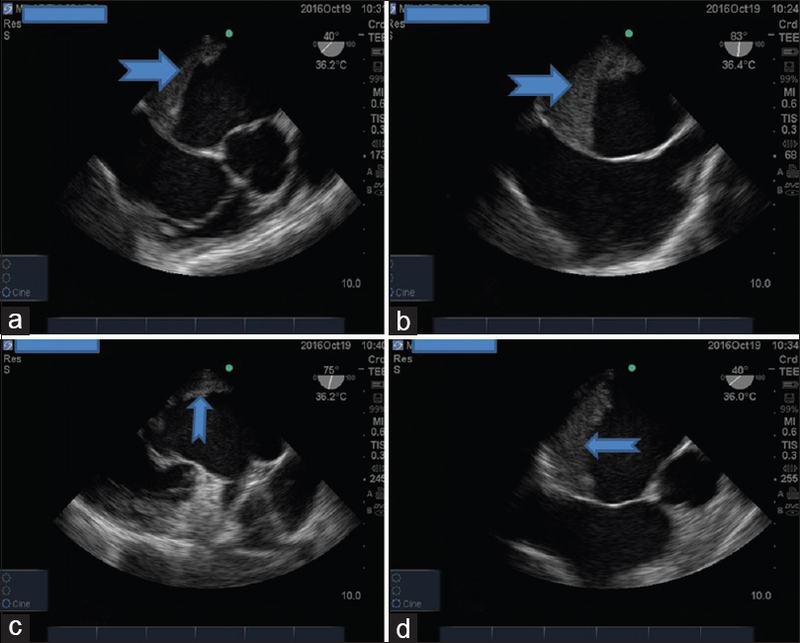 Usefulness of transthoracic echocardiography for identification of left atrial thrombus before balloon mitral valvuloplasty. Am J Cardiol 2003;92:1132-4. Abdelmoneim SS, Pellikka PA, Mulvagh SL. Contrast echocardiography for assessment of left ventricular thrombi. J Ultrasound Med 2014;33:1337-44. Manjunath CN, Srinivasa KH, Ravindranath KS, Manohar JS, Prabhavathi B, Dattatreya PV, et al. Balloon mitral valvotomy in patients with mitral stenosis and left atrial thrombus. Catheter Cardiovasc Interv 2009;74:653-61. Manjunath CN, Srinivasa KH, Panneerselvam A, Prabhavathi B, Ravindranath KS, Rangan K, et al. Incidence and predictors of left atrial thrombus in patients with rheumatic mitral stenosis and sinus rhythm: A transesophageal echocardiographic study. Echocardiography 2011;28:457-60.